Gather your intelligence to create a resume that can boost your career as a data analyst. If you’re a wiz at compiling and reviewing data, but your resume feels randomly pieced together, it’s time to gather your intelligence. A comprehensive resume can help you land top data analyst jobs, says resume expert Kim Isaacs. 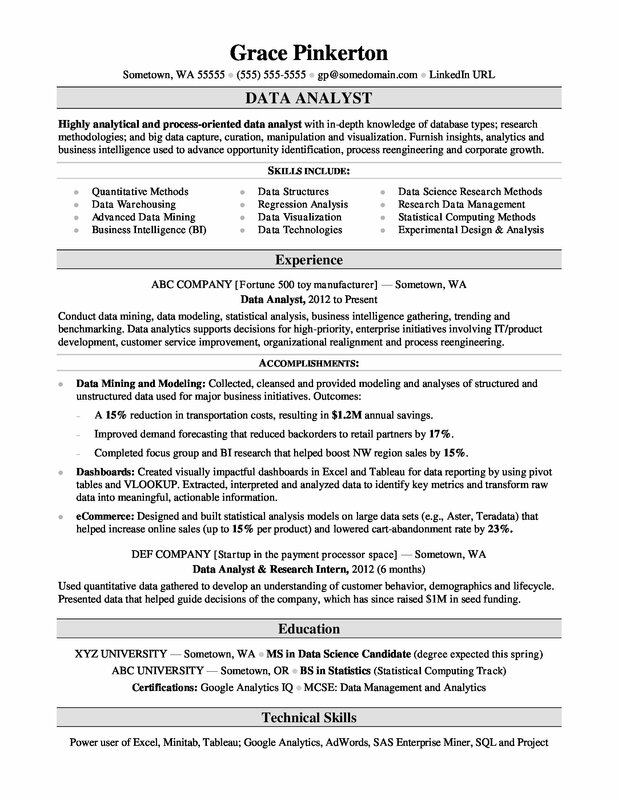 For writing tips, view this sample resume for a data analyst that Isaacs created below, or download the data analyst resume template in Word. Jobs for data analysts are projected to grow by 27% (or 31,300 jobs) from 2016 through 2026, which is much faster than average, according to the Bureau of Labor Statistics (BLS). You'll find the highest level of employment for this job in the following states: California, Texas, Virginia, Illinois, and New York; and in the following metropolitan areas: Washington D.C., New York City, Dallas, Phoenix, and Boston. As a waitress, you can expect to earn a median wage of $81,390 per year, or $39.13 per hour, according to the BLS. Additionally, you can learn about business careers and search for data analyst jobs on Monster. Highly analytical and process-oriented data analyst with in-depth knowledge of database types; research methodologies; and big data capture, curation, manipulation and visualization. Furnish insights, analytics and business intelligence used to advance opportunity identification, process reengineering and corporate growth. Conduct data mining, data modeling, statistical analysis, business intelligence gathering, trending and benchmarking. Data analytics supports decisions for high-priority, enterprise initiatives involving IT/product development, customer service improvement, organizational realignment and process reengineering. — A 15% reduction in transportation costs, resulting in $1.2M annual savings. — Improved demand forecasting that reduced backorders to retail partners by 17%. — Completed focus group and BI research that helped boost NW region sales by 15%. Dashboards: Created visually impactful dashboards in Excel and Tableau for data reporting by using pivot tables and VLOOKUP. Extracted, interpreted and analyzed data to identify key metrics and transform raw data into meaningful, actionable information. eCommerce: Designed and built statistical analysis models on large data sets (e.g., Aster, Teradata) that helped increase online sales (up to 15% per product) and lowered cart-abandonment rate by 23%. Used quantitative data gathered to develop an understanding of customer behavior, demographics and lifecycle. Presented data that helped guide decisions of the company, which has since raised $1M in seed funding. There are many steps to a successful job search, but no matter what industry you're in, the first step is the same: having a solid, organized resume that will attract hiring managers. Could you use some help fine-tuning it? Get a free resume evaluation today from the experts at Monster's Resume Writing Service. You'll get detailed feedback in two business days, including a review of your resume's appearance and content, and a prediction of a recruiter's first impression. Get noticed today!